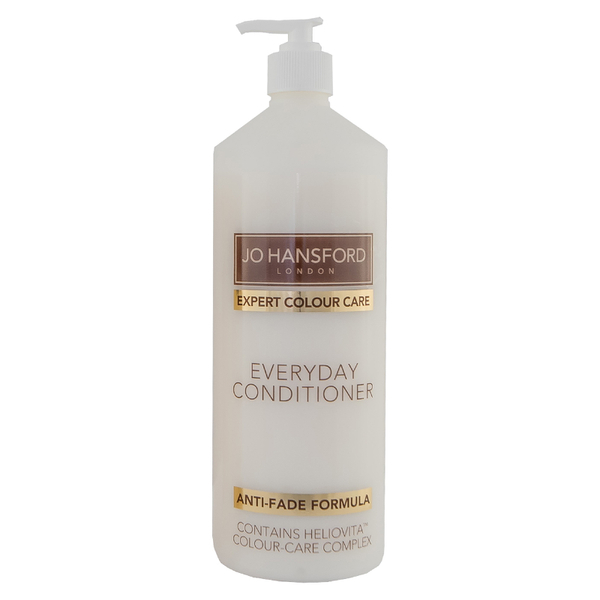 Nourish locks with the Expert Colour Care Everyday Supersize Conditioner from Jo Hansford. Exclusively developed in her Mayfair salon and utilising advanced technologies to protect and enhance natural or chemically coloured hair, the lightweight formula works to detangle and smooth hair while infusing it with essential moisture and vitamins. Natural concentrated extracts of Sunflower Seed and Jojoba Oil combat free radical damage and enhance hairs natural elasticity, plus the addition of protein-rich Keratin Amino Acids repair surface damage and minimise the appearance of split ends. Expect manageable, silky soft and glossy hair with a professional finish and reinvigorated colour. Aqua (Water), Cetearyl Alcohol, Dimethicone, Cetyl Alcohol, Cetrimonium Chloride, Phenoxyethanol, Benzyl Alcohol, Simmondsia Chinensis (Jojoba) Seed Oil, Hydroxyethylcellulose, Limonene, Sodium PCA, Keratin Amino Acids, Butylene Glycol, Sodium Lactate, Parfum, Disodium EDTA, Arginine, Dehydroacetic Acid, Aspartic Acid, Sodium Chloride, Hydrolysed Lupine Seed Extract, Helianthus Annuus Seed Extract, PCA, Glycine, Alanine, Serine, Valine, Glucanolactone, Threonine, Proline, Isoleucine, Phenylalanine, Histidine, Sodium Benzoate, EDTA.